Panoramic photo of the Duddon Valley by John Rousseau. See www.rousseaugallery.co.uk for more images. Set in the Duddon Valley, a hidden jewel of Lakeland, Wallabarrow holiday cottage lies in a remote unspoilt corner of the Lake District National Park in Cumbria. High Wallabarrow is a traditional hill farm owned by the National Trust, situated at the end of a quiet no-through road with only footpaths and bridleways beyond. The self-catering cottage nestles below the impressive Wallabarrow Crag (1,000ft) there are wonderful walks straight from the door, ranging from low level riverside and woodland walks to the higher fells, including Harter Fell and the Coniston range. The 16th century Newfield Inn, open all day serving good food and real ales, is a delightful 15 minute walk through Wallabarrow Woods and across the River Duddon. Also the Blacksmiths Arms at Broughton Mills (four miles) serves excellent food. Whilst on your farm holiday in the Duddon Valley free range eggs from the extremely free range hens are usually available for you to buy and sometimes other produce such as Herdwick lamb and Galloway beef. Occaisionally we have home produced charcoal and fruit and vegetables grown organically in the garden and polytunnel. 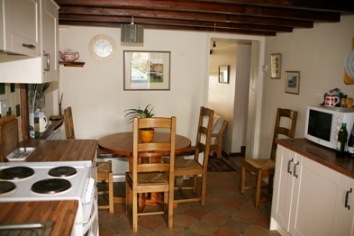 The self-catering cottage is centrally heated and is cosy all year round. Bed linen and electricity are included (please bring towels). For 'wee uns' we have a 3-wheeler jogger and a macpac carrier which visitors are welcome to borrow. Well behaved dogs are welcome and must always be under control as they are likely to encounter sheep, cows, horses, chickens, rabbits, working dogs and young children on a daily basis! The self-catering holiday cottage accommodation comprises a newly fitted cottage kitchen with views to the Dunnerdale Fells and 'Caw'; two bedrooms, a family room upstairs with a king size bed and a single bed (stair gate available) and a single bedroom downstairs with a four foot (small double) bed. In addition there is a full size futon in the living room downstairs, where there is a colour TV with Freesat and DVD player. A stable door looks out across the beck onto the shared garden and up to the fells. The bathroom is downstairs and has a shower-head over the bath. We also have bunkhouse accommodation available from £10 pppn (available periodically by arrangement) and a lovely camping barn sleeping up to 10 at £10 pppn. From August 2013, we will have two Yurts available for weekly or 3 and 4 night stays -- ask Chris about prices and availability.